I remember working years ago at a lumber company for a rather disagreeable boss. He was very demanding and expected a lot out of me and certain other employees. I watched as others did less work but received the same pay. One day I asked about his management style and in a slightly different way told me Jesus’ words from today’s parable: “I tell you that to everyone who has, more will be given.” He told me he expected a lot because I had been given the talent to excel so he demanded more from me than others. He rewarded me with a small raise and with even higher demands and expectations. This is what Jesus is telling us. As Christians, equipped for service in God’s kingdom, we are expected to produce fruit for his kingdom. Like the servants, we are given what we need to accomplish the task and are expected to show an increase. We cannot expect to ignore our talents, thinking God will be pleased. We must be about the Father’s business. Nor can we think in terms of reward. In our parable, Jesus gave the faithful more responsibility. We go because God first loved us and equips us for service. 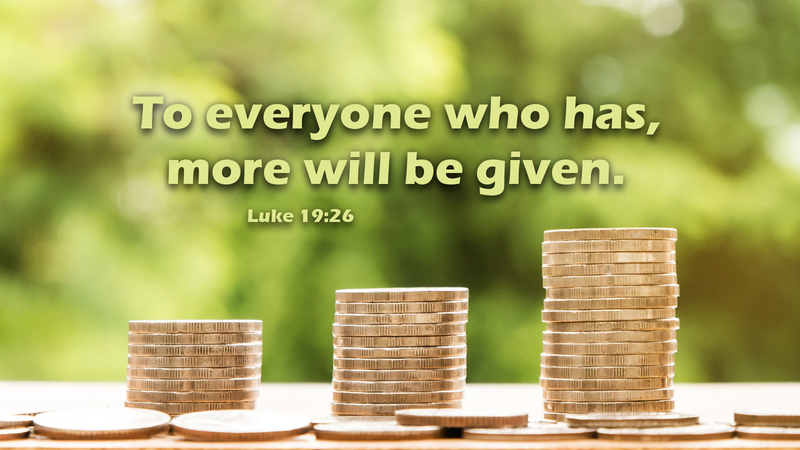 Prayer: Heavenly Father, help us to use the gifts you give in your service; in Jesus’ name. Amen.